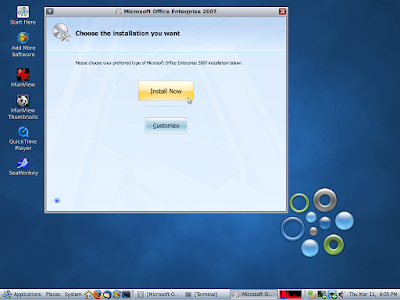 Today I thought I would show everyone just how easy it is to install and use Microsoft Office 2007 on OpenSolaris 2009.06 and 2010.03 with Bordeaux for Solaris. 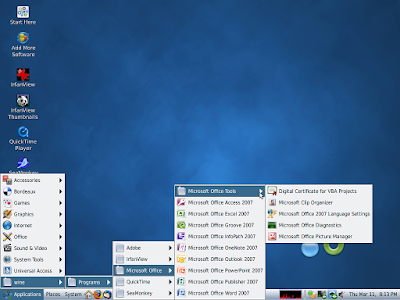 I have installed Office 2007 on both 2009.06 and 2010.03 build 134 the screenshots below are from 2009.06 running in Virtual Box. 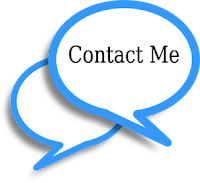 The first thing you will need to do is make sure you have all the needed software dependencies resolved on OpenSolaris. Here is the list of needed packages from the Bordeaux OpenSolaris 2.0.2 readme. be found in the OpenSolaris repository and the Contrib repository. Wine also uses the packages listed below depending on the software in use. SUNWxsane = Graphical scanning frontend for the SANE scanner interface. The next thing you will need to do is purchase a copy of Bordeaux if you haven't already done so. After you install Bordeaux you can start the UI two different ways. After the bordeaux UI starts all you have to do is double click Office 2007 and the install will begin, its that simple... But If you run the UI through your terminal you can then see everything that's taking place in the background. Once the install begins it will install some needed third party dependencies and it also installs all of the Microsoft Core Fonts for you. 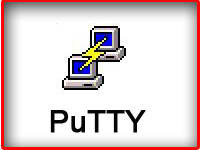 After this has completed a run dialog will appear and ask you for the location of the Office Installer, simply browse to where the setup.exe is located and select it, and then Office will start it's install. Microsoft Office 2007 key verification. Microsoft Office 2007 install completed on OpenSolaris. Option three is good for Microsoft Publisher and OneNote as we don't provide shortcuts in the user bin directory at this time. Also with option two and three you can see whats going on while the application is running. 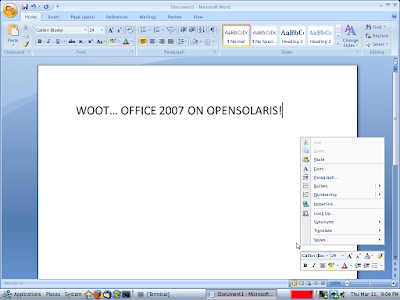 Microsoft Word 2007 on OpenSolaris. 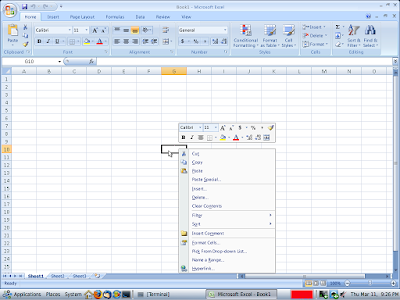 Microsoft Excel 2007 on OpenSolaris. 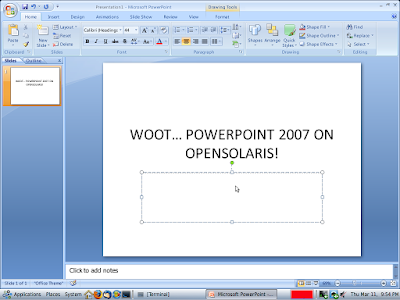 Microsoft PowerPoint 2007 on OpenSolaris. 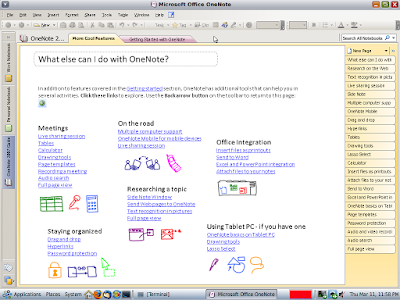 Microsoft OneNote 2007 on OpenSolaris. 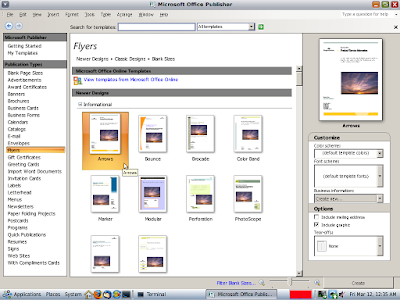 Microsoft Publisher 2007 on OpenSolaris. Microsoft Outlook will run, but at this time it's not usable. 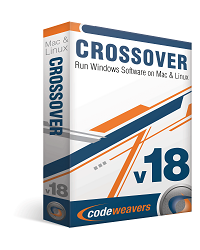 I also tried to run Groove and Access but they both crashed on execution. If you don't want to spend $25.00 for Bordeaux you also have the option to download the Wine source code and compile Wine with it's needed dependencies. Once this is done you will need to install all the needed windows redistributable dependencies and then install Office for free. The old saying goes time is money, and for only $25.00 Bordeaux will save you many hours of work. But then again if you like to tinker compiling Wine on your own might be the way to go. B.T.W Bordeaux also runs on Linux, FreeBSD, PC-BSD and Mac OSX... And is being ported to StormOS and Nexenta at this time.